Mayoral elections broke both ways for livability in American cities yesterday: The results of some may slow progress on transit and street safety, while one-midsized city elected an executive who campaigned strongly on light rail expansion and bikeability. The biggest story was Cincinnati’s mayoral race, where Queen City voters backed Democrat John Cranley by a wide margin. 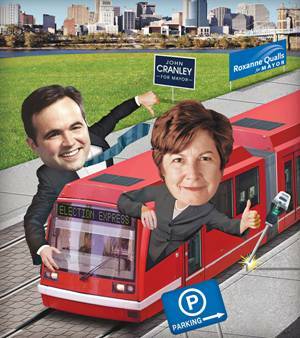 Cranley campaigned on a platform of tearing out the city’s under-construction streetcar, even though stopping the streetcar at this point could be more expensive for the city than continuing it. Cranley doesn’t have the power to stop the streetcar unilaterally. He will need council approval. But the Cincinnati City Council added three new members yesterday as well, and now a majority appear to oppose the project. Hopefully, reason and respect for public finances will still prevail in this case. Cranley defeated former Cincinnati mayor Roxanne Qualls, who was vice mayor to outgoing Mayor Mark Mallory. While Qualls made it this far thanks in part to the political activism of streetcar supporters, her defeat was a blow to their cause. Meanwhile, a champion of sustainable transportation in Seattle, Mayor Mike McGinn, fell to challenger Ed Murray, a state senator best known for crafting the state’s marriage equality law. McGinn came to the office as a political outsider after serving as the statewide chair of the Sierra Club and was known to ride an e-bike to political events. He presided over major zoning and parking reforms in the city, as well as some important street redesigns. Murray campaigned on a platform of uniting various political factions and making government work better. Last month, alt-weekly the Stranger wondered if he was also running to be the “anti-bike lane mayor.” Some of Murray’s fundraising came from groups who were upset about a recently-installed protected bike lane, the paper reported. On transit, Murray has stressed the importance of taking a regional approach and building collaborative relationships at the state level, but not necessarily the need for additional funding. There was happier news in Pittsburgh, where long-time City Council member Bill Peduto cruised to an easy win over Republican opponent Josh Wander. Peduto has ambitious plans to make the city more bike-friendly and to invest in a new light rail system. Under his leadership, Pittsburgh seems to be on its way to big things. No surprises in NYC, where Bill de Blasio defeated long-shot Republican challenger Joe Lhota. After a period of caginess and, at times, hostility to the street redesigns installed under Mayor Michael Bloomberg, de Blasio has gone on record saying he supports changes like bike lanes and pedestrian plazas. While de Blasio made ambitious promises to reduce traffic deaths and improve bus service during the campaign, local advocates are bracing for a mayor who may not have the same willingness as his predecessor to see those projects through. Killing infrastructure projects while they are in progress is the kind of thing that happens in third-world countries. This happening in the US is just embarrassing. Let’s see, what happened to the last mayor that tried to kill a major transit project already in the works? Chris Christie killed the ARC tunnel, and got re-elected in a landslide. Didn’t he just allow a new NEC tunnel to go through? Yes after stealing the federal money earmarked for it so he wouldn’t have to raise gas taxes. If De Blasio wants to reduce disparity in NYC, he will be forced to acknowledge liveable streets. Remarkable that an urban Democrat wants to kill a transit project and reallocate the funds to an interchange. Anyone have any thoughts on Boston’s mayoral election as it pertains to livable streets? i saw both candidates speak on livable streets issues. Connolly would have been a better choice I think. I know Walsh was the bigger public transit person between the two. He’s definitely behind expanding cycling infrastructure although with more of a focus on pedestrian and cyclist safety. He understands that people would like to be able to safely bike places with their kids – Dot, Mattapan, Rozzie, where he won, are all very big on bikes (the current admin seems to not want to acknowledge this for some reason – and people who don’t live there don’t know this either) – except it’s much more kids and commuters who are parents. Connolly probably would have been more aggressive on bike infrastructure, but Walsh was the better candidate for issues surrounding the MBTA. Cincinnati is the only city to have built a subway and never opened it. Will they also become the only city to have laid streetcar tracks and never opened them? Cincy is certainly trying to fail, trying really hard to fail as a city and collapse. It will probably, indeed, fail, given how hard it is trying. But we can hope. Cincy seems to be the home of stupid. Actually, the whole Ohio River Valley is a problem; Indianapolis is even worse. It is likely that it is starting to acquire the demographics of failure which Appalachia has. Ford is unbelievable. We can hope Toronto votes in 2014 for a mayor who isn’t a crackhead. Or, hell, an honest crackhead would be an improvement over Rob “I was too drunk to realize that I was smoking crack” Ford. Rochester’s streetcar subway operated for years before being closed; it was ripped out in the Transit Holocaust or Streetcar Conspiracy period when streetcar systems were being bought out by GM/Firestone/etc. I think Cincy is the only city in the US to have abandoned a subway tunnel after finishing construction and before running any trains through it. By the way, this is more evidence that the US *is* a third-world / underdeveloped country, which I have been saying since Bush stole the election in 2000.
won’t be repaired for years. they can enjoy walkable lifestyles. tomorrow. Many look to the 1980?s for enlightenment and reflection. Its not too late to save our streetcar. We can have a rail system AND great neighborhoods. Telling residents to pick one or the other is ridiculous. And thus Cincinnati’s decline goes on unabated. People need to understand that development follows transport links. The higher capacity those links are, the more people can and want to live near them. Roads built for cars have lousy capacity, the worst of all major forms of land-based transport. One 10-foot lane can carry 2 000 cars an hour on the highway, but only 1 000 in a city. One 10-foot pedestrian walkway can carry maybe 6 000 to 8 000 people per hour (but it’s highly dependent on distance). One bus lane can carry around 3 000 to 5 000 people per hour (if the area is serviced, otherwise it can be much higher) One 10- foot LRT track can carry up to 15 000 people per hour (though most have a capacity more around 6 000 to 8 000). A 10-foot subway track can carry 30 000 people and more per hour. So if you want to reverse the population decline, you must offer transport means with much higher capacity for the same area, and the only way to do that is through transit investments. This is why transit advocates need to care about timeframes and cost. Streetcars aren’t something that should take years to build, and should be up and running quickly and affordably. But they let these things get mired in needless bureaucracy masquerading as democracy, driving up costs and giving opponents more time to kill projects. Demographics? Nonsense. We got a transit-friendly mayor right at the source of the Ohio River Valley. Rob Ford used the very same urban/suburban divisiveness tactics. Excellent. So Cranley is in good company. Would just like to point out these are all democrats killing all streetsblogs beloved projects. The love of cars and fear of parking is pervasive and bipartisan. The majority of Cincinnati’s tax revenue comes from a 2.1% earnings tax that is levied on anyone who works inside the city limits. Its fair to assume that downtown and its 50,000+ workers provide the majority of the cities revenue. If you want to compare the “capacity” of highways to bus lanes, LRT tracks or subway tracks, you don’t use vehicles per hour for one and passengers per hour for the other. If you want to say highway capacity is 2,000 cars (vehicles) an hour, then the capacity of a LRT track might be, what?, 10 trains (vehicles) per hour? If the average car has a “capacity” of 5 persons, then the “capacity” of a highway lane is 10,000 people per hour. Your comparisons assume the least efficient use of highways and the most efficient use of transit. Seldom is the case. If your objective is to maximize the people carrying capacity of your transportation system for the least cost to the public, your objective would be best served by carpools and vanpools, not by trains and buses. I’m sorry, but you’re wrong. Sure, in theory cars could carry 10 000 people per hour in one lane, but that’s a capacity that is completely unreachable in real-life, where the average occupancy is 1,3 people per vehicle on average, and more like 1,1 and 1,2 for commutes. Meanwhile, the capacity of transit IS attainable and is often reached in many cities, not along the whole line of course, but at their most used, even suburban bus lines tend to have all seats filled at peak time at parts of their route, which is more than 60 or 70% of capacity, versus more like 30% for cars. Many subway and LRT lines all across North America are at capacity at peak time at certain points of their routes, even those that aren’t are at 80-90% capacity easily. You may accuse me of assuming the least efficient use of highways and the most efficient use of transit, but I’m not assuming anything, I’m pointing out the REAL, ACTUAL use of highways and transit. The real use of highways is the least efficient use. The real use of transit (in downtown areas during peak, mind you) is the most efficient use. The issue here is that cars create sprawl while transit creates dense developments near lines. That is inevitable because cars demand a lot of parking space, these parking lots force buildings to be built spread apart, and cars are very versatile, so every single office has workers coming in from a variety of locations, many taking different highways, reducing the possibility of pickups. And then, you have the issue of people having flexible hours, which is impossible to deal with in carpools if there is no other means of getting home, because all people of the carpool needs to arrive and leave at the same time. Transit is much more flexible than that, in general. Carpools and vanpools therefore will never be solutions to increase capacity the way transit offers, their use is very limited and they don’t allow the creation of dense cities where walking and cycling are reasonable alternatives to driving either (carpools and vanpools need parking too, just a bit less). Carpooling is just a band-aid, it’s not a cure. What’s to capacity of a gallon jug? If the average number of people in an elevator is one, what’s its capacity. What’s the capacity of an Amtrak train? If your church has 100 seats that are half filled for one hour a week, what’s the capacity of the church? Now I’m beginning to wonder if you really DO mean to deceive…. The term “capacity” is completely appropriate. The real physical capacity is in vehicles per hour, but for cars, the capacity in people per hour equals the number of cars times the average occupancy, not their maximum occupancy. That’s the operational capacity. It matters a lot because if more people want to access that lane than that limit in peak hour, they won’t be able to, but will face congestion. Let’s take an example, a car lane maxed out in terms of vehicles, 1 800 vehicles per hour at an occupancy of 1,2 people per car, so around 2 000 people per hour, versus a bus lane maxed out with 30 buses per hour, each with a capacity of 80 but 67 people in actual occupancy, for 2 000 people per hour. Let’s say demand increases by 400 people in both cases, what happens? In the case of the car lane, these 400 people represent about 330 more cars, because occupancy is inflexible, these cannot go through during that hour, because the maximum vehicle capacity is maxed out. You have congestion, 330 cars will be in line to access that lane when the hour has passed. The lane is stuck at 1 800 vehicles per hour and 2 000 people per hour. In the case of the bus line, these 400 people just hop into buses, which aren’t at capacity, so instead of 67 people per bus, we have 80 people per bus, which they can take. The bus line now carries 2 400 people per hour, the flexible occupancy has absorbed the increase in demand. So it is appropriate to take into account the average occupancy of cars to estimate capacity, in fact it would be inappropriate to ignore average occupancy in estimating the capacity of car lanes (like you did). Your point would only be valid if people facing congestion would simply leave their cars on the side of the road and hitch a ride from other people in cars, thus occupancy would quickly respond to an increase in demand to accommodate higher capacity. Of course, that is insane and would never work. If I go with your reasoning, I could say that a bus lane has a capacity of 86 400 people per hour, because buses can follow one another at 5-second intervals if they don’t have to stop to serve stops, letting people embark or disembark. At 5-second intervals, that would mean 720 buses per hour, and articulated buses can have 120 people in them, so 86 400 people per lane. But of course, that is not reasonable. In reality, buses need to stop and serve areas, letting people on and off, and those stops mean that a bus lane has a much lower capacity than that. Some bus lanes on bridges do exist that operate like bus-only highways, but in cases like this, capacity is actually influenced by occupancy, because as buses don’t stop in that corridor, it means that buses likely flow in from various feeder lines, and if buses from one feeder line are full, people who want to get on them cannot simply hop in to buses from another feeder line that is not full. By your reasoning, a highway with two lanes in each direction that isn’t already carrying 10,000 people per hour in each direction is not operating at capacity and certainly shouldn’t have any lanes added. Does this accurately describe your belief? You can hypothesize all you you want (and apparently you want to hypothesize a lot!) but if your basic premise is wrong, your conclusion is going to be wrong. If you’re going to insist that “…the capacity in people per hour equals the number of cars times the average occupancy, not their maximum occupancy…”, then you must agree that the same metric applies to buses. Based on an average car occupancy of 1.2, the average bus is equivalent to 7.5 average cars. If you compare the capacity of a bus (80, you say) to the capacity of a car (5), then a full bus is equivalent to 16 average cars. But you hypothesize a car’s capacity is 1.2 and a bus’ capacity is 67. In a system where buses aren’t operating at full capacity in both directions, no buses should be added. Average occupancy in a bus means nothing with regards to capacity, because when more people want to use the bus, occupancy just increases in reaction (up to a maximum). When people wait at a bus stop, you think they see a bus come pass, count and say “oh wait, there is already 9 people in that bus, that is the average occupancy, I will thus let the bus pass”? Of course not, they hop on because there’s plenty of space left. Cars and transit operate differently, more demand means more vehicles on the road but the same occupancy for cars, more demand for buses translate in higher occupancy per vehicle and possibly more vehicles (up to a limit in both cases). Let me apply your reasoning to cars, the FHWA says that the average daily traffic per lane in the US on arterials is 5 107 vehicles. 5 107 divided by 24 hours means about 213 cars per hour on average. Therefore it would mean that car lanes have a capacity of 213 cars per hour and 277 people per hour (based on 1,3 average occupancy). This most recent comment of yours is one of the dumbest comments I’ve seen in a while. It leaves me with two possibilities: either you’re just a troll or you really are that dumb. In either cases, you’re just not worth it. As far as I am concerned, this discussion is over. Have a nice life. Evidently, valar84 is no longer with us, having run off in defeat. So let me direct my closing comments to the masses who are still reading this. valar84 compares oranges and apples, declares an apples to apples comparison to be dumb, and then announces his/her departure without waiting for a reply. No, but I expect transit agencies to base service frequency on loading guidelines which require significant loads on each bus – certainly much more than the number 9 that you threw out, and a lot more than the 24% occupancy (that’s 1.2 people per car with a maximum capacity of 5) that cars have. Correction to my earlier post: that 10,000 should read 20,000 (or 10,000 per lane).